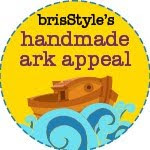 Hopefully you've heard about the Handmade Ark ... so far we've raised over $2500. So keep buying up big and help float the Handmade Ark. Now over at http://monpetitpoppet.blogspot.com a softie drive is underway. "At present there are literally thousands of Queenslanders making emergency shelters their home ... All I ask of you to is make one small softie (or oodles if you like!!!) to provide a child in these shelters a small comfort and hope that people are rallying behind them"
I will be sending in a babushka doll softie ... if you'd like to get involved visit her blog and let her know you want 'softie' in!